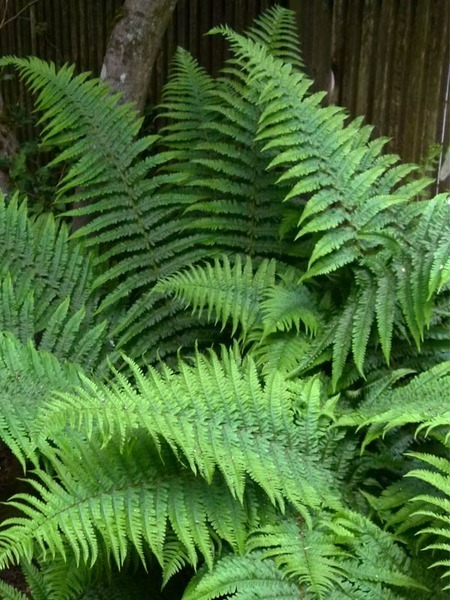 Best Ferns for a Shady Garden. Looking for some perennials for a yard with deep shade and wet soil? 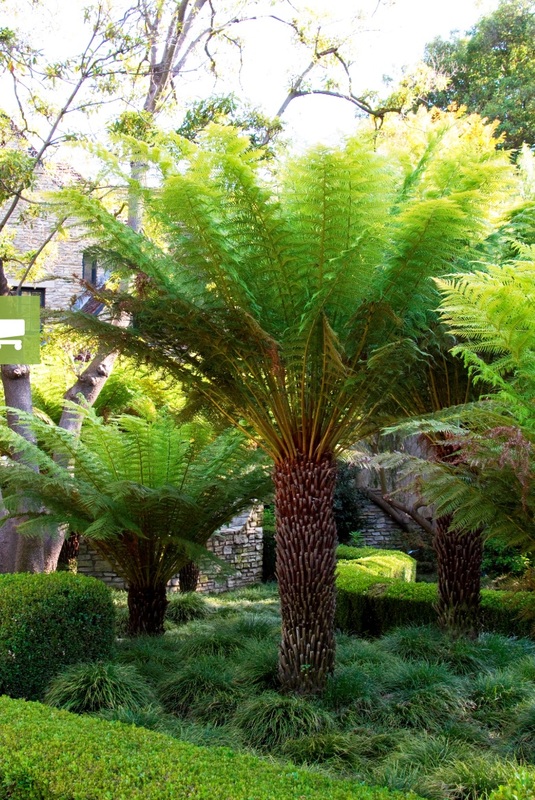 Best ferns for a yard area with deep shade or soil that stays wet. Do you have a yard or garden area that limits what you can grow? A yard with deep shade that prevents grass from growing. Are there bald spots under trees in your lawn? Places that you can’t seem to grow anything? Frustrated by the lack of success you’ve had in these areas. No need to get frustrated because you haven’t had much luck growing many plants in your shady garden areas. There are many perennials that thrive in deep shade. In fact, there are perennials that will grow in areas that stay moist most of the time. We’re faced with a similar yard problem. Water that doesn’t drain quickly. Bald spots underneath trees. Grass grows in patches here and there. The only growth that seems to take a foothold under the large maple trees are the disgusting weeds! Luckily there are some solutions to turn our shade prone lawn with bald spots into a lush, lively green garden. For areas that are dry and shady there are many planting options. For shady and moist yard areas, ferns might be the right solution for growing a nice garden bed. 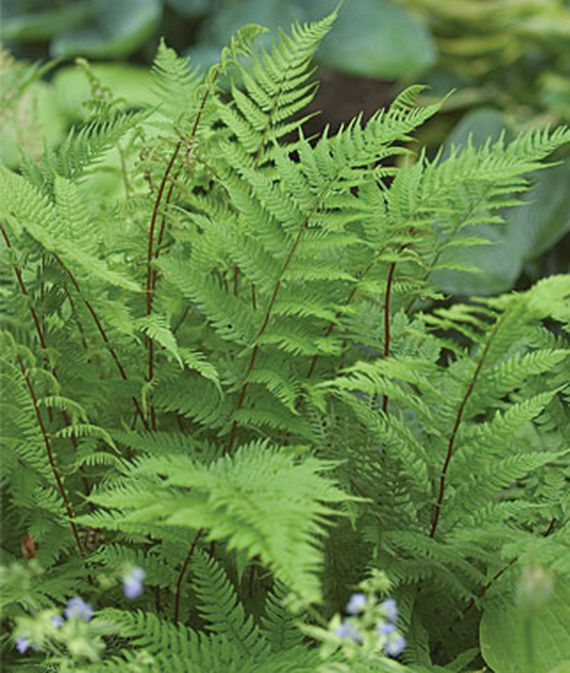 Ferns can transform a moist, shady yard into a lush, thriving green shade garden. Planting ferns in your garden will keep the area green and cover the exposed bald areas. Ferns are one of the perennials that grow in deep shade. Ferns appear soft, graceful, and so natural. They can transform a bear soil exposed dark area into a lush, vigorous growing shady garden. 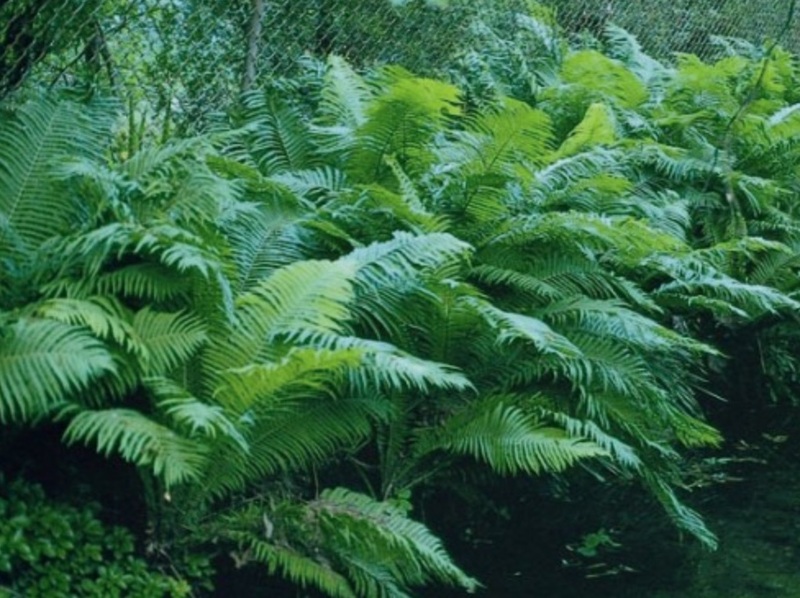 We’ve rounded up 21 of the Best Ferns ever! To brighten that deep, dark yard area. 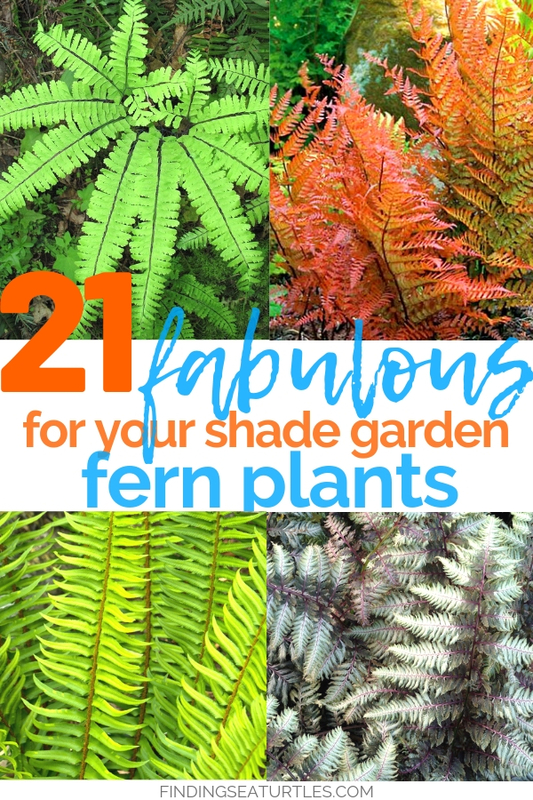 Take a look at these gorgeous ferns to create a lush, lively, bright garden spot. Be sure to let us know what you think. A unique colored Japanese fern, Lady in Red Fern has striking bright red stalks. With its delicate lacy fronds, Lady in Red grows upright reaching 2 to 3 feet in height. Best in moist, humusy soils, Lady in Red grows in zones 2 to 8. Likes part Sun and part shade to full shade. Resistant to rabbits, the fern can be planted as accents or in drifts. The Robust Male Fern has large flowing fronds of rich emerald green highlighted with subtle golden edges. Elegant and tops out at 4 to 5 feet tall and wide. Grows in zones 4 to 8 in part Sun and part shade to full shade. Deer and rabbit resistant, Robust Male will grow in soil that is normal, acidic, or sandy. Tolerant of shade, dry shade, and wet site garden areas. 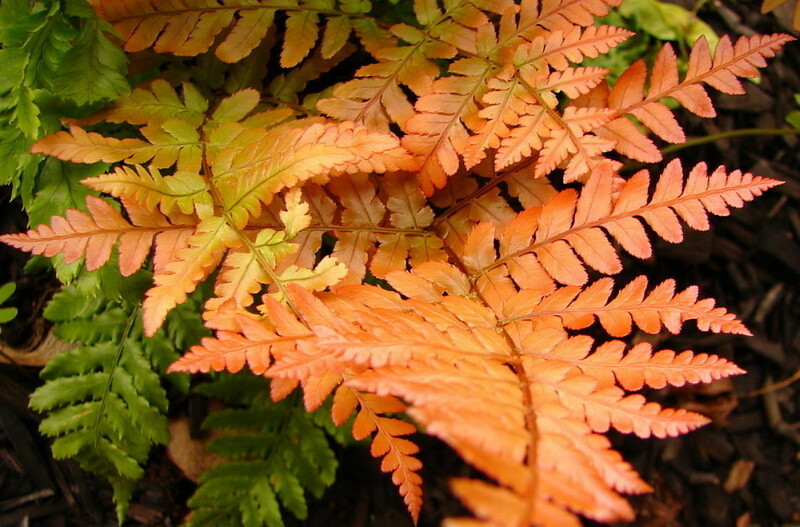 Brilliance Autumn Fern or Dryopteris erythrosora, has bright copper red fronds that arch. The fronds turn deep green in the Summer Sun. Easy to grow, Brilliance Autumn is hardy in zones 5-8. Grows in part Sun and part shade or full shade. Topping out at 18 to 24 inches in height and width. Regular watering keeps soil moist around the Brilliance Autumn Fern. Plant in an area protected from high winds. 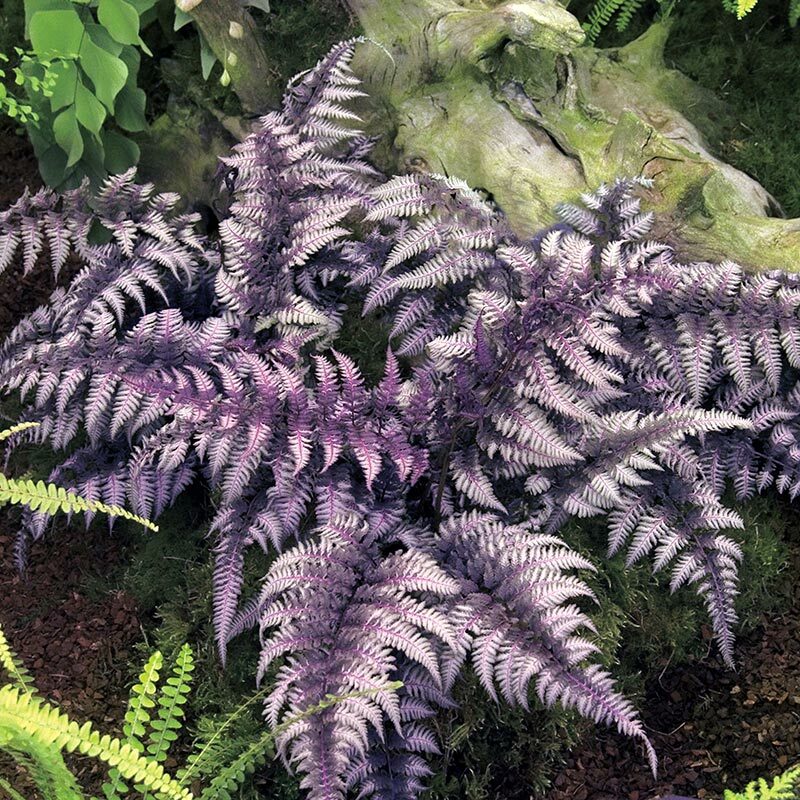 Ghost Athyrium has beautiful fronds with metallic silver sheen that appear to glow, with maroon midribs. Deer resistant Ghost Athyrium grows in zones 4 to 8 in part Sun and part shade or full shade. Reaching between 24 to 30 inches tall and wide. Easy to grow Ghost Athyrium likes rich, moist, well-draining soil. Christmas Fern or Polystichum acrostichoides has rich green colors with soft textures that thrive in deep shade. Lance shaped leaflets narrow to a point and form in dense clusters. Grows in zones 2 to 9 in part Sun and part shade or full shade. Stands 24 to 36 inches tall and 24 to 36 inches wide. A lush green fern, Christmas Fern is hardy and is evergreen. Deer Fern or Blechnum spicant has sterile leaves spread flat that form a glossy, evergreen groundcover. 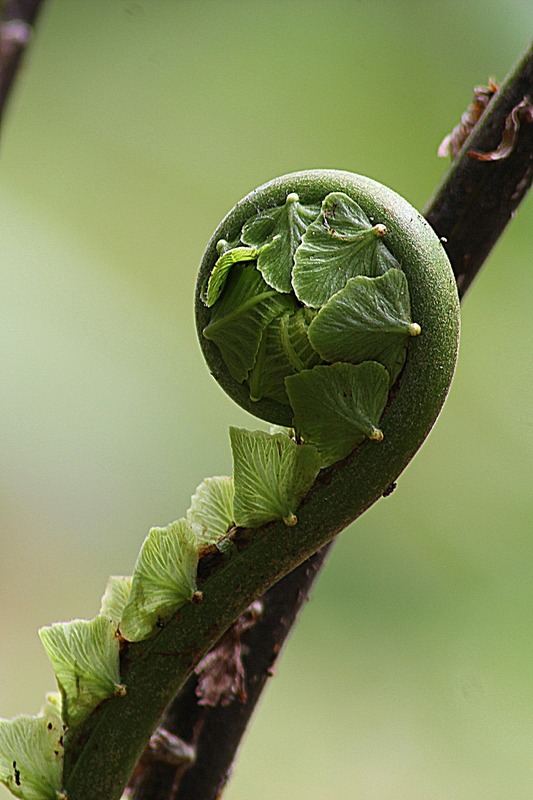 Leaves emerge upright from the center of the fern during midsummer. Grows in zones 5 to 8 in part shade and part Sun or full shade. Reaches 8 to 20 inches tall and about 24 in. wide. Water Deer Fern regularly to maintain wet or evenly moist soil. 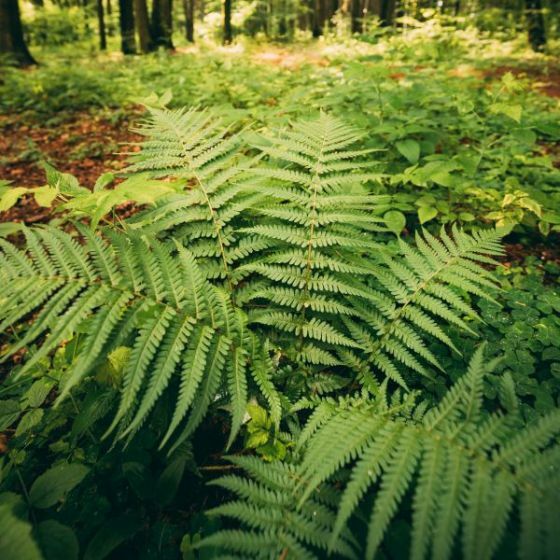 Use Deer Fern in borders, as ground cover, or in a woodland setting. A moderate grower that tolerates coastal exposure. 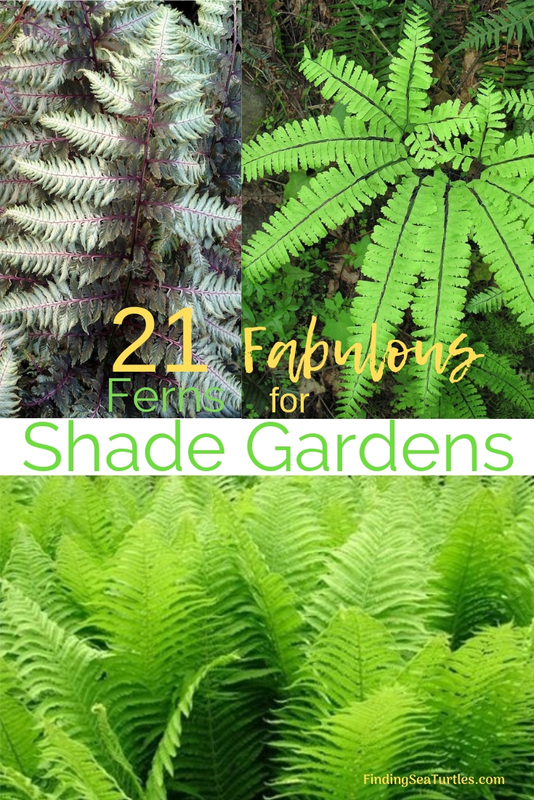 A deep shade loving fern that adds texture to a garden. 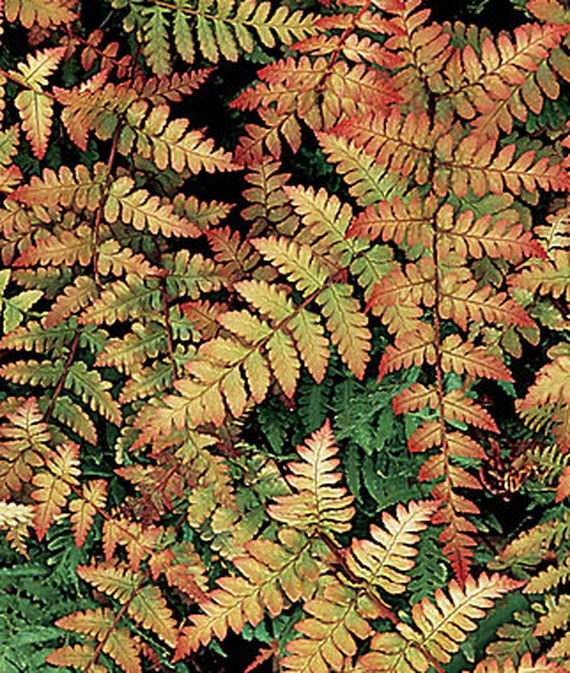 Autumn Fern or Dryopteris erythrosora displays its best colors in the Spring. Fall colored foliage that transforms with the seasons. Fresh growth appears in metallic coppery green. Summer months see the Autumn Fern turning to green. In the Fall season, fronds become a bronzy color. The frond undersides have scarlet spores to add another layer of interest. Grows in zones 5 to 9 in part Sun and part shade or full shade. Tops out at 24 to 30 inches tall and 15 to 18 inches wide. Grows best with moist, slightly acidic soil. 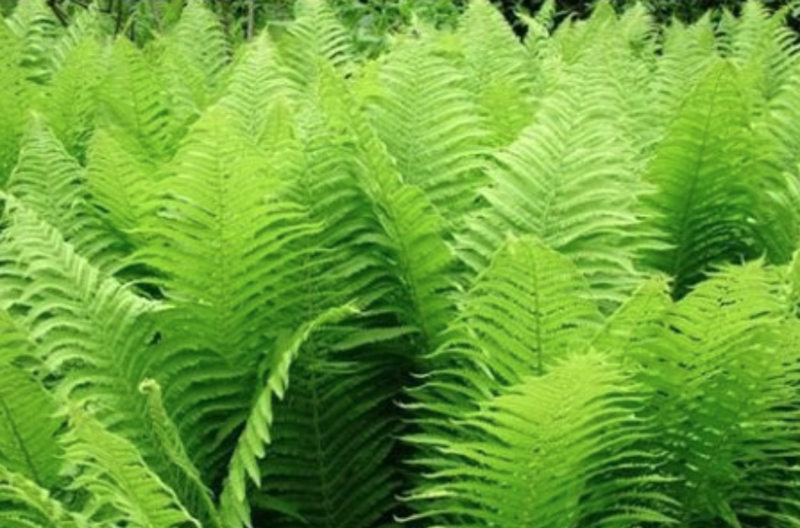 Resistant to rabbits, plant Autumn Fern in garden beds and along garden borders. Victoria Lady Fern or Athyrium filix femina ‘Victoriae’ have tiny twisted leaves that cross each other. A vigorous grower referred to as the “Queen of Green”. Plant Victoria Lady in zones 4 to 8. Grows between 18 to 24 inches tall and wide. Grows best in part Sun and part shade to full Shade garden. Likes moist to moist well-drained garden soil. A fern popular during Victorian days. Discovered in 1861 in Scotland. Dixie Wood Fern or Dryopteris x australis has lustrous dark green fronds. Dixie Wood Fern grows in zones 5 to 9 in part shade and part Sun to full shade. Moderate growing with an upright habit, Dixie Wood reaches 24 inches wide and 4 feet tall. Water regularly to maintain an evenly moist soil in the garden. Bold Dixie Wood makes a beautiful backdrop for smaller shade loving plants in the garden. Thrives in moist settings. Northern Maidenhair Fern or Adiantum pedatum has horizontal horseshoe-like wreath foliage on tall wiry black stems. Grows in zones 3 to 8 in part shade and part Sun to full shade. Tops out between 12 to 24 inches in height and 20 to 24 inches wide. 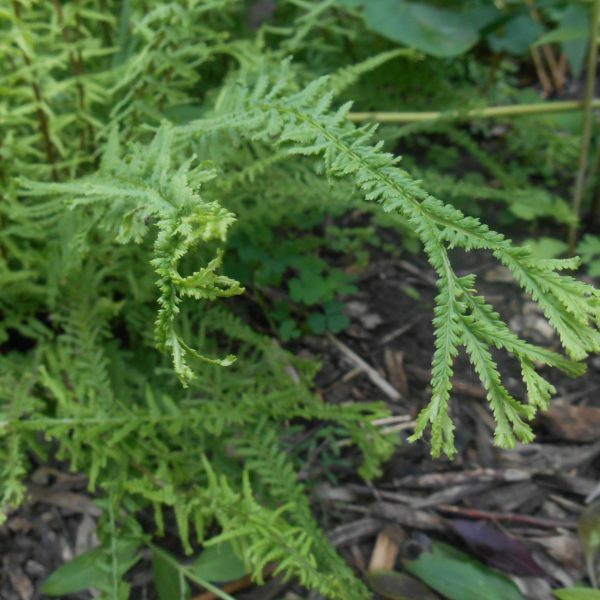 Easy to grow Northern Maidenhair Fern thrives in average garden soil. Keep moist through Spring and Summer seasons. Burgundy Lace Japanese Painted Fern or Athyrium niponicum has lance-shaped pinnate fronds. The fronds have striking burgundy, pink and silver tones. Fronds appear in Spring in a rich purple color with silver accents. 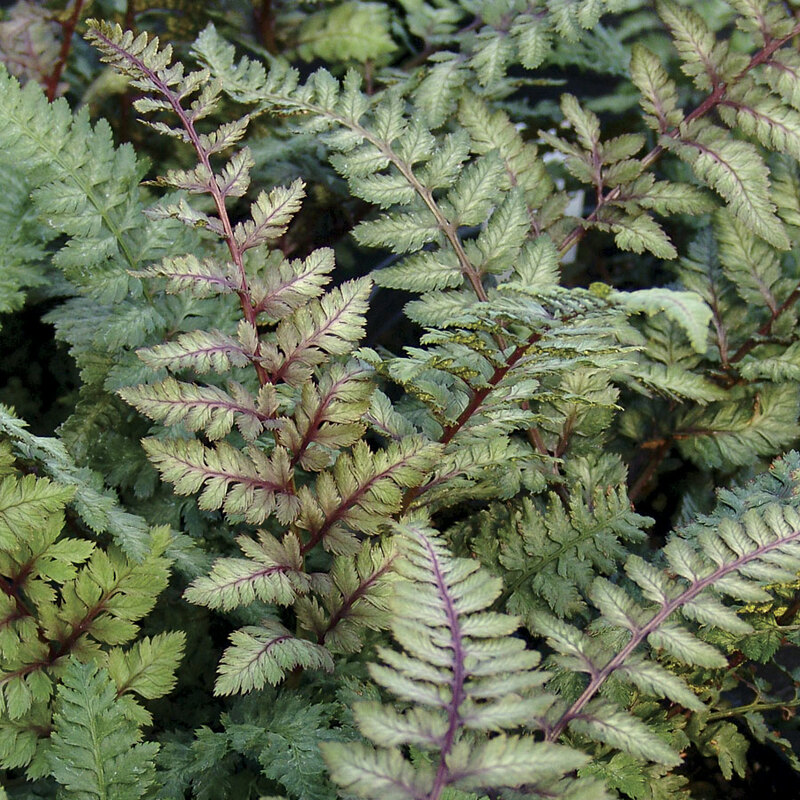 During Summer, the Burgundy Lace Fern fronds lighten to pink tinted silvery grey with ruby red veins. Grows in zones 3 to 8 in part Sun and part shade to full shade. Topping out at 12 to 18 inches tall with a spread of 12 to 18 inches wide. 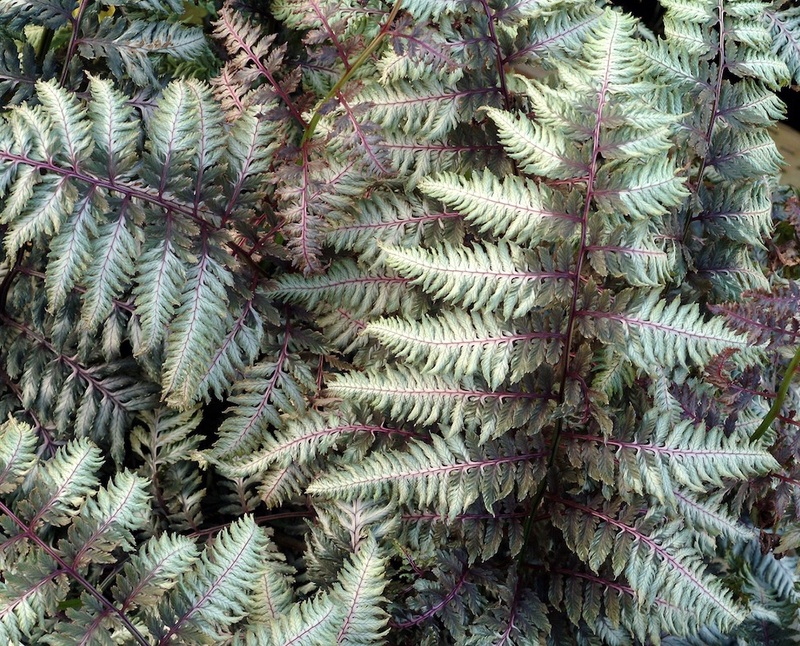 Burgundy Lace Japanese Painted Fern is stunning in a shade garden. 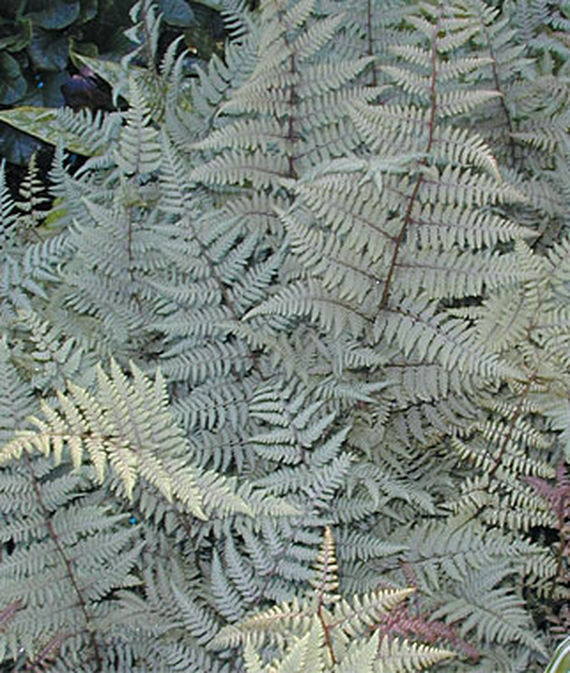 Elegant Pewter Lace Painted Fern or Athyrium niponicum has pewter-colored foliage with a metallic sheen. Pewter Lace grows in zones 5 to 8 in part shade and part sun to full shade. Low, spreading form of Pewter Lace is a moderate grower. Reaching about 15 inches tall with a spread of 12 inches. Water regularly to maintain evenly moist garden soil. Use Pewter Lace as a border, for erosion control, or wet garden areas. An elegant fern, the Log Fern or Dryopteris celsa has large 2 to 3 feet long, deep green fronds. Grows in zones 5 to 9 in part shade and part Sun to full shade. Reaches 36 to 48 inches in height with a spread of 18 to 30 inches wide. Found growing in rotten logs on the forest floor, the Log Fern is a moderate grower. Water regularly to maintain evenly moist garden soil. Ideal for wet garden areas, where the Log Fern will thrive. Tasmanian Tree Fern or Dicksonia antarctica has bright green foliage with a fine, lacy texture. A dark brown trunk holds a spreading crown of the feathery, arching fronds. The fronds are between 3 to 6 feet long. Grows in zones 9 to 11, likes part Sun and part shade or full shade. A slow grower, the Tasmanian Tree reaches 15 ft tall and 12 ft wide. Water regularly to maintain evenly moist garden soil. A beautiful accent, the Tasmanian Tree provides year round interest. Protect from hot weather or any intense winds. Robust Western Sword Fern or Polystichum munitum has glossy, leathery, toothed, dark green foliage. Evergreen clumps are formed by fronds up to four feet long in cool, shady sites. Grows in zones 5 to 9 in part Sun to part shade or full shade. Dense foliage clumps 3 to 6 feet tall and wide. Water regularly to maintain evenly moist soil. A hardy native male fern, the Western Sword can be used for erosion control or woodland plantings. Regal Red Japanese Painted Fern has burgundy leaves and stems enhanced with silver overlays on the leaflets. The fronds are 8 to 20 inches long. Grows in zones 3 to 8 in part Sun to part shade or full shade. Stands at 18 inches tall with a spread of 18 to 24 inches wide. Deer and rabbit resistant, the Regal Red adds stunning color to any garden. Drought tolerant, the Regal Red Fern can also be planted alongside rocks. Japanese Beech Fern has green fronds. Grows in zones 4 to 9 in part Sun to part shade or full shade. A fast grower, the Japanese Beech reaches 3 feet tall and wide. Water regularly to maintain evenly moist garden soil. Use the Japanese Beech Fern in shaded rock gardens or in mixed woodlands. Ostrich Fern or Matteuccia has yellow green leaves that arch. Ostrich Fern is hardy in zones 3 to 9 in Sun or shade. Tops out between 36 to 48 inches tall. Graceful and pleasing, the Ostrich Fern is stunning. One of the many best ferns! Button Fern or Pellaea rotundifolia has cascading, leathery, button-shaped leaflets. Grows in zones 8 to 9 in filtered sun to full shade. Reaches 18 inches tall and wide. Water regularly and more often in extreme heat. 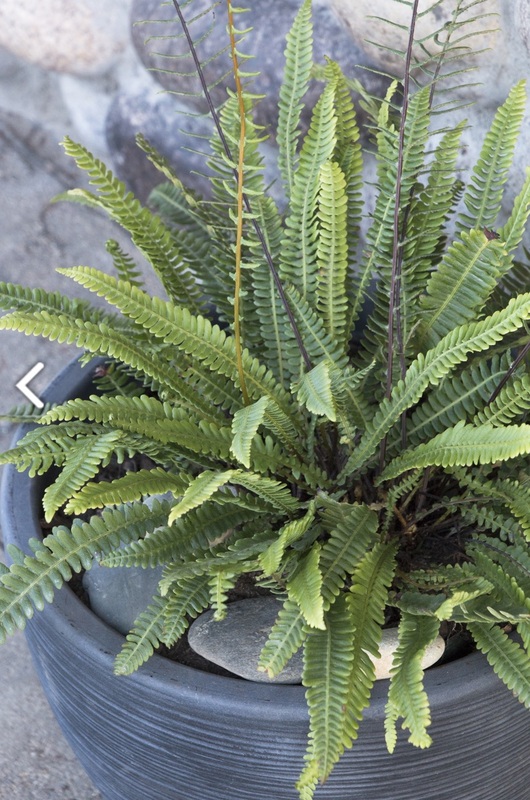 A New Zealand native, Button Fern will tolerate dry conditions. 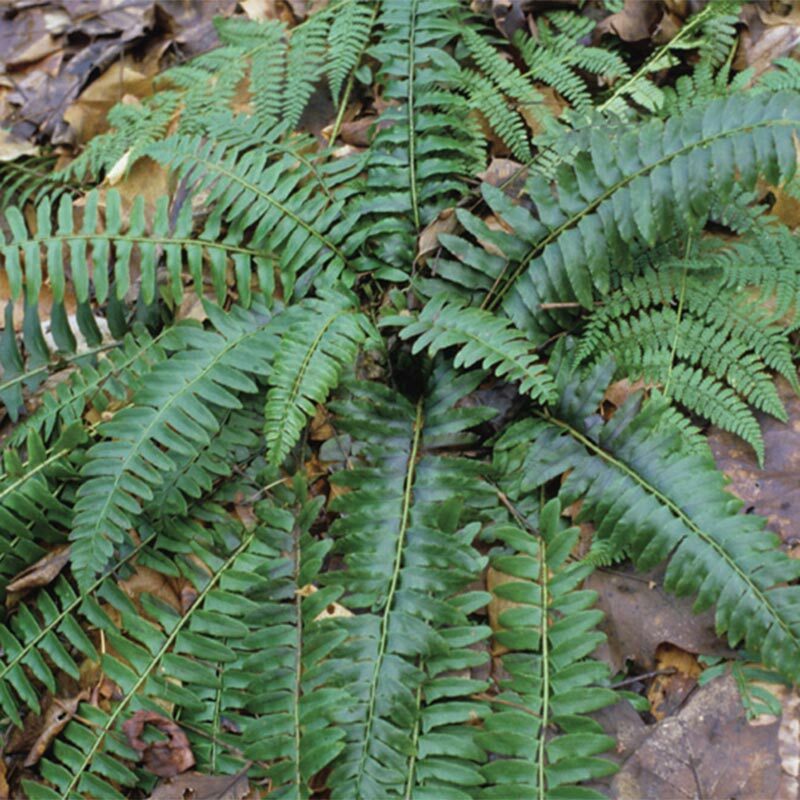 Soft Shield Fern or Polystichum munitum has glossy, leathery, toothed, dark green foliage. Grows in zones 5 to 9 in full shade. Water regularly to maintain an evenly moist garden soil. A moderate grower, the Soft Shield Fern reaches 2 to 3 feet tall, spreading wider. 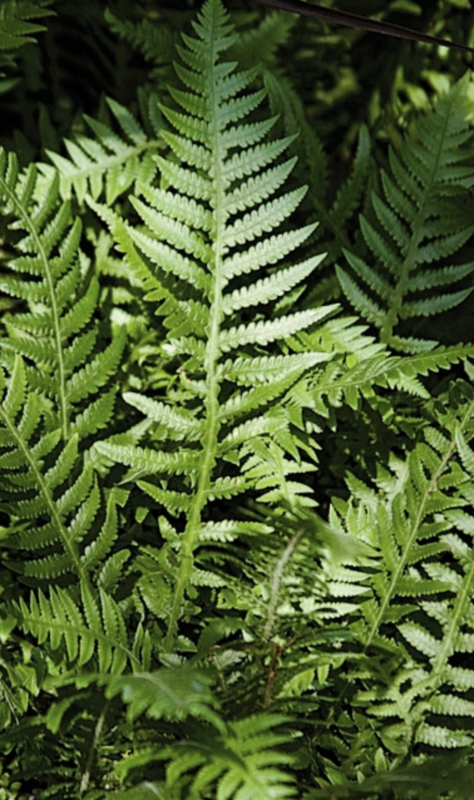 Hardy Soft Shield Fern is a North American native that performs well in full shade dark areas. 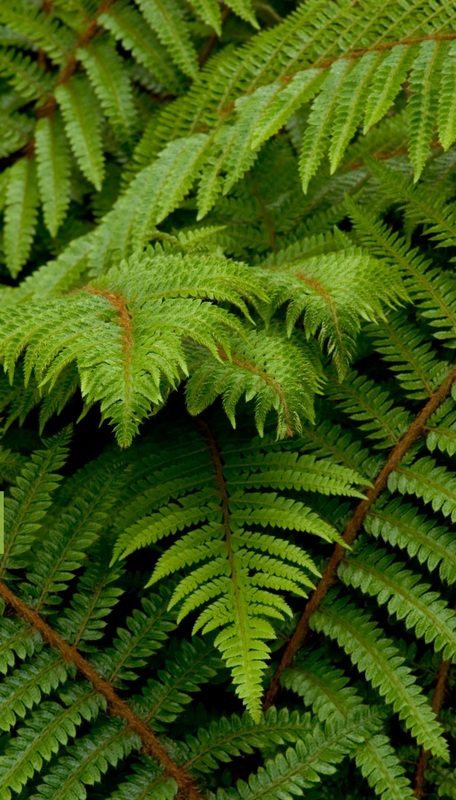 The Beautiful Wood Fern or Dryopteris pulcherrima, is a variety of fern, typically used for ornamental purposes. 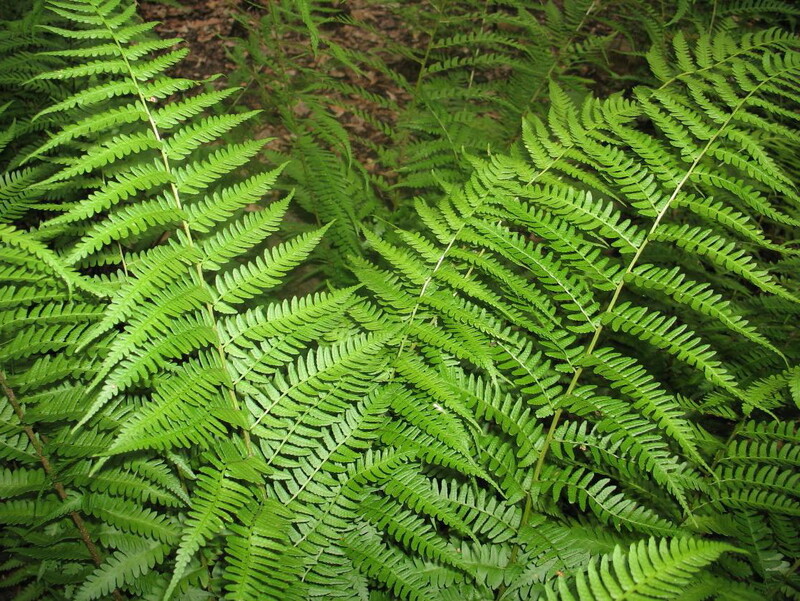 Wood fern has rich green, arching evergreen groundcover. Grows in zones 6 to 9 in full Shade. tops out at 18 to 24 inches tall and wide. 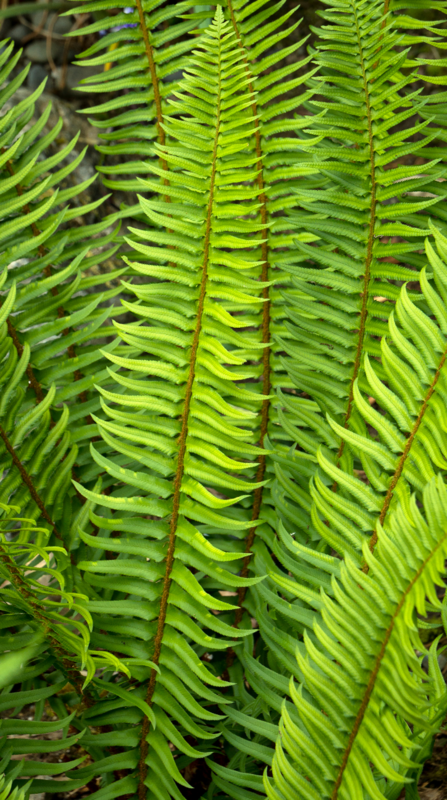 With a medium growth rate, the Beautiful Wood Fern has a light airy appearance. Likes an average to moist garden soil. Heat and drought tolerant. 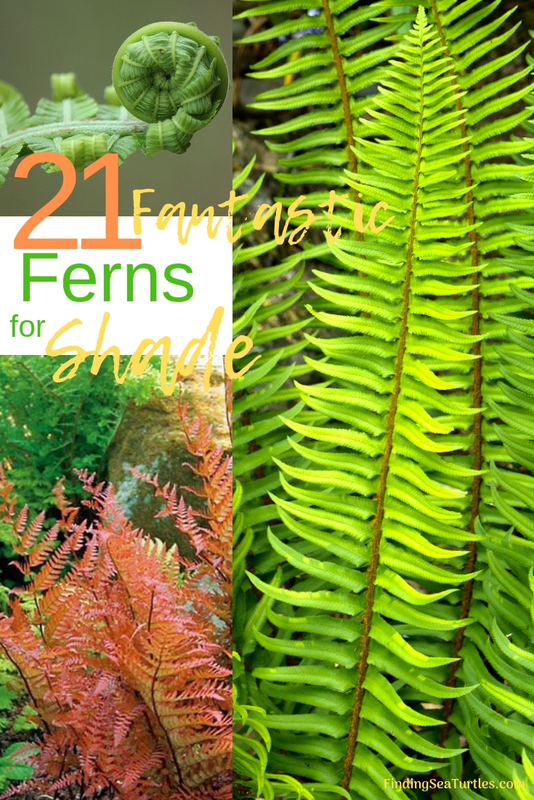 These are 21 Best Ferns for Your Garden that will thrive in part shade to full shade gardens. 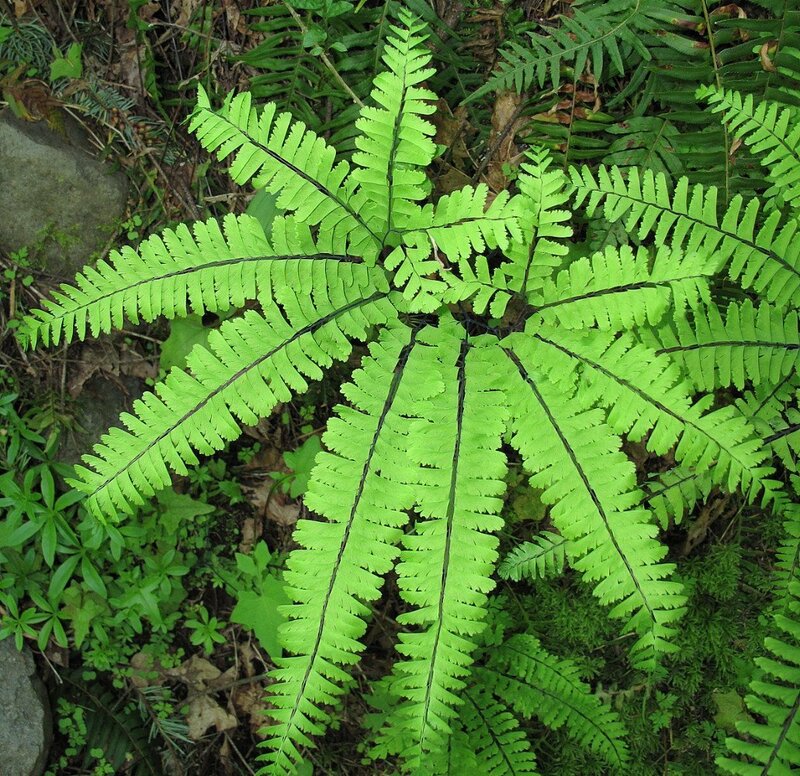 Plant ferns in garden areas with deep shade. For additional ideas for planting perennials in dry, shady lawn areas see our post 24 Spectacular Shade Garden Perennials. For perennials that will grow in a sandy soil garden see our post on 22 Sandy Soil Perennials For Shade. And if you have a walnut tree in your yard, see our post on 23 Juglone Tolerant Shade Plants For Black Walnut Areas. 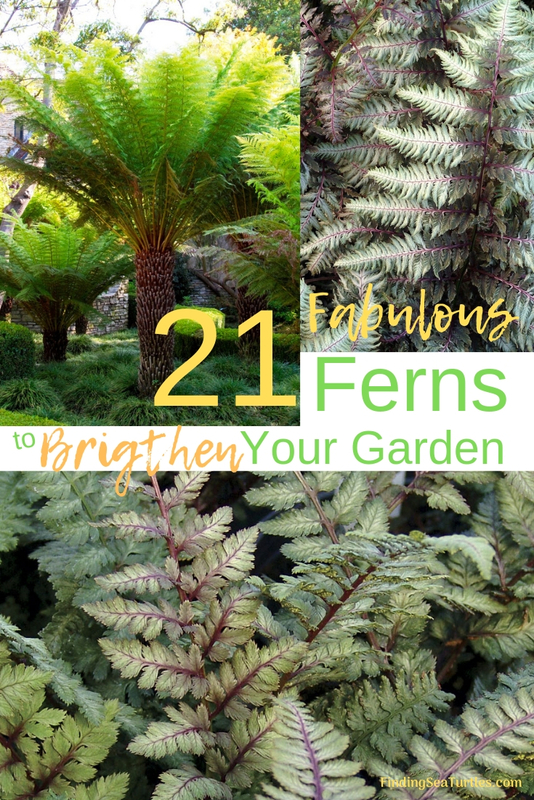 If you try any of these 21 Best Ferns for Your Garden be sure to let us know how you make out. And if you have any questions, feel free to reach out to us in the comments below. We always are ready to help you out. Thank you for dropping by.